Oktoberfest – All around the world and right around the corner from you. It’s officially on! The Oktoberfest has started in Munich this past weekend. Have you watched or perhaps even been part of the traditional opening ceremony? It’s always a fun event, starting with the Grand Entry Parade with the Oktoberfest landlords and their festive horse carriages loaded with beer barrels to the entertaining procession of the various costume groups, historic riflemen, flag throwers and many other performers … all on their way to the famous Oktoberfest grounds at the Theresienwiese. Oktoberfest has come a long way since the day when Bavaria celebrated the wedding of Crown Prince Ludwig in October of 1810. Today, you can consider it almost a worldwide event in the sense that you can find and celebrate at some Oktoberfest near you almost anywhere you are on the globe. In the U.S. alone, there are plenty of them you can attend with the largest one in Cincinnati according to Wikipedia. The list is explosively expanding every year. Many of the ‘Oktoberfests‘ in California listed in our last year’s post are still happening this year with many new ones popping out all over. In fact, the media is full of suggestions of where to go (Bay Area Events & SoCal Events ), so we didn’t dedicate a separate post to all the listings this year. However, we’d like to highlight very traditional ones, which have been known to be in California for a long time. One of them is the Oktoberfest at the Phoenix Club in Anaheim, which has put on an Oktoberfest for more than 55 years! This year they started out their festivities right at the same time as the original Oktoberfest in Munich, on September 21st. You can celebrate Oktoberfest at the Phoenix Club every weekend until October 28th, and starting on October 7th – you can enjoy a delicious German Sunday brunch just before you dive into the rest of the fun. End your Oktoberfest outing with a hearty meal and a large ‘Mass’ at their beer garden. Check out their website for more information. This Saturday, September 16th, it’s official: It’s Oktoberfest Time! At 12 noon (CET), Munich’s mayor will tap the first Oktoberfest-beer-barrel and exclaim “O’zapft is” ! And the ‘world’s largest beer festival’ can begin! But you don’t have to fly to Munich to get into Oktoberfest mood. We have quite a few choices to celebrate Oktoberfest here in California, too. If you live in Northern California or Southern California, you for sure will find some Oktoberfest festivity even close by your neighborhood. We highlighted a few ‘Oktoberfests’, that we thought might peak your interest. Check them out below! The Phoenix Club in Anaheim features Orange County’s oldest and most authentic Oktoberfest. OKTOBERFEST 2017 will take place every weekend Sept 22-Oct 29! Traditional bands play every day! Our Schuhplattler perform Saturdays and Sundays. The special events on the first weekend include the Official Keg Tapping Ceremony and the Opening Parade. SHOOTING GALLERY: Our Phoenix Schützen (traditional air rifle club) will have their rifle range open to the public on Saturdays (6:00 PM) and Sundays (1:00 PM) Oct. 1 – Oct 29. ADMISSION: $10 -Adults on Friday, Saturday and Sunday, Phoenix Club members with card $5 – under 18 enter FREE! Jeanette’s Edelweiss is starting Oktoberfest the original way. Like in Munich also here Oktoberfest is rung in by the official tapping of the first beer keg. Instead of the mayor of Munich it will be the Consul General of Germany, Joerg Neumann, who will perform the traditional ceremony on Saturday, September 16 at 4pm. Every FRI & SAT – 5 pm: Munich style Oktoberfest Party with Fun, Games and Live Music by the Jeanette’s Edelweiss Polka Band featuring Festmeister Hans. Every Sunday 4 pm: Family Fun Oktoberfest. Kids Oktoberfest with Gigi & Festmeister Hans. Games & Fun for the family. Every Thursday 5 pm: Oktoberfest Party! Besides Oktoberfest entertainment be ready for a real German culinary feast. Jeanette’s Edelweiss features authentic German cuisines by renowned German Chef Rocco Suckert from Cologne, Germany. Everything from German brats, Schnitzel, Sauberbraten, Ham Hocks, Rouladen and of course Pretzels and Gingerbread hearts can be yours! And you’ll have the choice of 12 imported German beers on draft. Admission: FREE – But Advanced Reservations are Recommended! Reserve your table: info@JeanettesEdelweiss.com (or 805-498-7300). The German American Societies of San Diego invite to their yearly traditional Oktoberfest! Two weekends full of authentic foods and original entertainment. Come and enjoy authentic German food, such as bratwurst, ox-on-the-spit, potato salad, potato pancakes, sauerkraut, red cabbage, pretzels, and a variety of German pastries. There will be a great selection of German beers and liquors, and soft drinks and water, to enjoy with your friends and family! Listen to the original group “The Guggenbach-Buam”, who came all the way out from Baden-Württemberg, Germany. These talented, entertaining musicians dress in traditional clothing, and play a variety of German music, just as you would hear in the beer gardens in Bavaria. Enjoy songs such as the chicken dance, polkas and waltzes, and all the famous beer-drinking tunes. Watch traditional folk dancing performances, compete in our numerous games and contests, check out vendor and craft booths, and treat your kids to their own Kids’ Zone! Bring your family and friends to El Cajon and experience a real German Oktoberfest! Admission: $10 Friday and Saturdays; $5 Sundays. Esther’s German Bakery is celebrating its 10th annual Oktoberfest ! Oktoberfest – Kick off is around noon on Saturday, September 30th. Outside on the front patio you’ll see the food tent serving the Oktoberfest menu and plenty of tables for trying the seasonal Oktoberfest beers. If you like more shade, check out our ‘Biergarten’ in the back. For entertainment Esther’s German Bakery will have a favorite local German band playing festival songs from 3:00 – 8:00pm. Traditional German beer games are on the plan all night long. Come and meet some neighbors and celebrate Oktoberfest the traditional way! On Sunday, in case you missed Saturday’s main event, the bakery will be hosting their Hangover Brunch. Both the front patio and back biergarten will be open. It’ll be back to the daily menu then, but you’ll still have plenty of seasonal beer choices and tasty German treats, and German music will of course welcome you inside. Make it an Oktoberfest weekend!!! SCHUG WINERY – SONOMA – The Oktoberfest serving wine! Beer is not your thing, but you love wine? Try the Oktoberfest (Wine-Fest) at Schug Winery in Sonoma. Owned by a German family, Schug Winery is proud to invite to an Oktoberfest of their own kind. The winery was founded by Walter Schug, who came to CA in the 60’s to make wine European style. Overlooking the Sonoma Valley you’ll be sipping Federweißer and enjoy plenty of traditional Oktoberfest entertainment. Get ready for Polka and accordion music, raffles for adults and children, a photo booth, Bean Bag Toss and more, while indulging on German specialties like Zwiebelkuchen, German cucumber salad, potato salad, German apple strudel, sausages, and of course fresh pretzels. Children will love the Arts & Crafts tables and will go home with a free pumpkin! Special: Polkageist West is lined up for our live music. WHERE: 602 Bonneau Road in Sonoma, CA 95476. Die Naturfreunde Oakland invite to their yearly Oktoberfest in Oakland on October 1st, 2017! It’s their biggest festival of the year! So, get ready for fun Oktoberfest entertainment while taking in stunning views of the Bay area. Authentic German food, beer, wine and non-alcoholic beverages will be available for purchase throughout the day. MUSIC & DANCING: The Bajuk Trio with the Schuhplattler Dancers performing a variety of German and Austrian folk dances. Music starts at 1pm. Let your dance out! OTHER ACTIVITIES: horseshoes | board games | candy roulette | playground | or just lounge in our alpine-style sun chairs soaking up the wunderbaren views of the SF Bay! BUY TICKETS online or show up early to ensure entry! PLEASE BRING CASH: Cash is the preferred method of payment. We do not accept debit cards or checks at the Oakland Nature Friends Club on the day of the event. There is no ATM on the premises. PARKING: Parking in the ONF lot is free but fills up quickly so arrive early. However, there is plenty of additional parking on Joaquin Miller Drive. We provide a free shuttle bus service (1PM to 5PM every 15 minutes) that will drive guests from the intersection of Butters and Joaquin Miller (near the fire station) to the festival grounds and back again. Placerville, CA, September 8, 2017—Come dance zee polka at the 7th Annual Placerville Oktoberfest on historic Main Street in Placerville on Saturday, September 16th from 3-8pm—presented by the Placerville Downtown Association. For the fifth time the German American Chamber of Commerce will bring Germany’s most famous fest to the Bay Area. Enjoy a night of delicious German food andOktoberfest beer, provided by Ludwig’s German Table. Blow Musik! will set the right tone with their traditional Bavarian polkas and our headliner Bayern Maiden will rock the house once more! LLGC in partnership with Gordon Biersch is bringing Munich’s famed festival to the San Jose community for all to enjoy!! Live German music, dancing, traditional food, and beer! ADMISSION: $20.00 includes food, 2 beer samplers, and music! Tickets online at www.playloslagos.com under Event Registration. Enegren Brewing Co. features authentic German Food with BIGGER BETTER PRETZELS and German music all day long with the German band Hazelnuss-Das Music . Make sure to get there early for the official barrel tapping of our Oktoberfest Märzen Lager and to get your limited edition steins! Oktoberfest DTLA is not your traditional Oktoberfest. You’ll find local breweries and California beers, but you can also still grab an authentic German Beer from Paulaner, the #1 Oktoberfest beer in the world! Food varies from traditional bratwursts and pretzels to Thai-Mexican fusion. Lot’s of music entertainment: Music ranges from awesome local bands like The Tom Nolan Band and rockabilly groups to beat boxers, with Hazelnuss Das Music band closing both nights to get everyone dancing to some awesome Oktoberfest tunes. ADMISSION: General admission is Free, and all ages are welcome. Tasting packages will be available for sale, but you’re free to come and just enjoy the music as well. Images: Copyright ©All Images are property of the respective organization, Phoenix Club, Jeanette’s Edelweiss, German American Societies of San Diego, Esther’s German Bakery, Schug Winery, Oakland Nature Friends. That’s correct. And originally Oktoberfest had actually been in October, precisely on October 17, 1810. 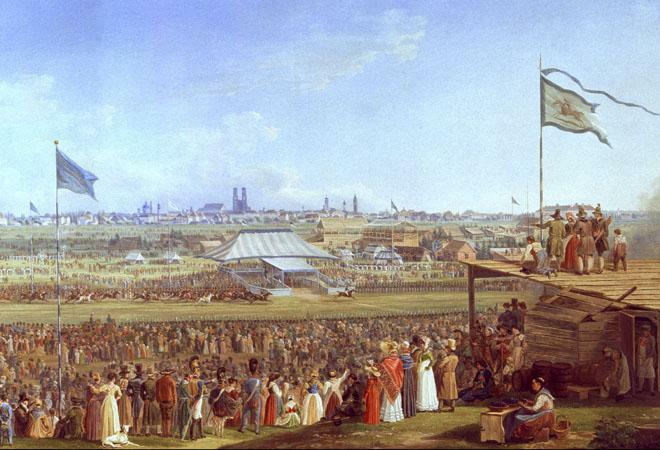 On that day the royal Bavarian newlyweds, crown prince Ludwig von Bayern and princess Therese von Sachsen-Hildburghausen, got honored with a royal horse race on the “Wiesn” (Munich’s Theresienwiese). This horse race was also the highlight of the weeklong wedding festivities . From that time on the horse race event turned into a yearly “Volksfest”, a public festival, which eventually got moved to late September instead of October. Over the years the event became bigger, and eateries and fun rides were added. The duration of the event got extended as well, from one day to several days to the now two weeks of Oktoberfest. 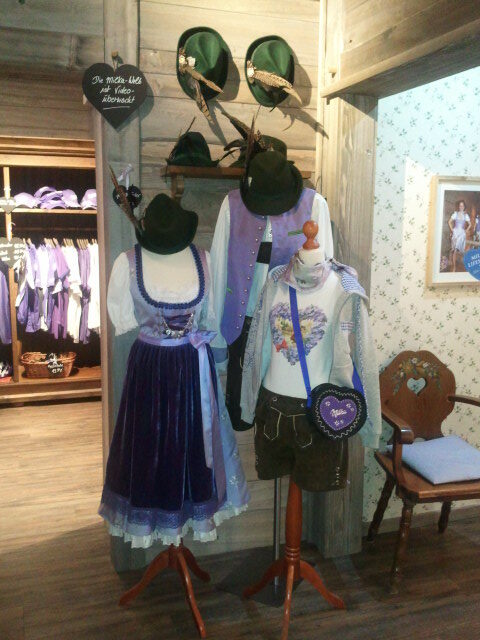 Custom is, that the last week of the two-week Oktoberfest is still in October! Today Munich’s Oktoberfest is the biggest “Volksfest” (public festival) in the world and attracts about six million visitors yearly! Celebrating Oktoberfest doesn’t necessarily mean you have to be in Munich. One can find some kind of Oktoberfest version almost anywhere these days. This is also the case for California, where Oktoberfest festivities are happening up and down the State. Here are some suggestions, that were brought to our attention. An extensive listing of Oktoberfest sites can be found here. Now get out your Dirndl and Lederhosen and …auf geht’s! The German American Chamber of Commerce (GACC) will bring Germany’s most famous fest to the Bay Area again this year – September 25, 2014! Join in for an authentic evening with delicious German food and Hofbräu beer provided by San Francisco’s restaurant Speisekammer. The Oktoberfest bands Blow Music! and Bayern Maiden will rock the house again! You can buy Schmankerl Tickets for $55 that will treat you to Pretzel, Schweinebraten (Roasted pork in beer sauce) or Bratwurst with Sauerkraut and potato salad. One litre of beer is included, and you can keep the Masskrug (1l beer mug) as a souvenir ! The other option is a beer ticket admission for $25, that will treat you to 0.5 l of beer including the mug to take home. Los Angeles Oktoberfest ® will open its doors again this year for a two-day event, October 4 & 5 at the Beverley Hills Country Club. Enjoy live entertainment from Bavarian Dancers to a Stein Holding Contest and much more. Traditional food and beer will be available for purchase while lively tunes and leading sing-along’s of old time drinking songs will keep you going. Tickets to this event are available here. All monies raised will benefit local charities Vista Del Mar & Chill Los Angeles. Oakland Nature Friends and Tourist Club hosts its Oktoberfest, Sunday October 5th, from 12-6pm. This is a fabulous family event. In addition to all the fun, food, drink, live music, and dancing of Oktoberfest, there will also be hikes, horseshoes and yodeling this year, and additional games, dances, and other activities especially for our younger members and guests. There is something for everyone of all ages at the Oakland Nature Friends’ Oktoberfest! Tickets to the event are sold on the Club’s website and are $10 ( plus $0.75 online processing fee) for adults. Children under 14 are FREE. Do you love Milka, in fact Milka chocolates? 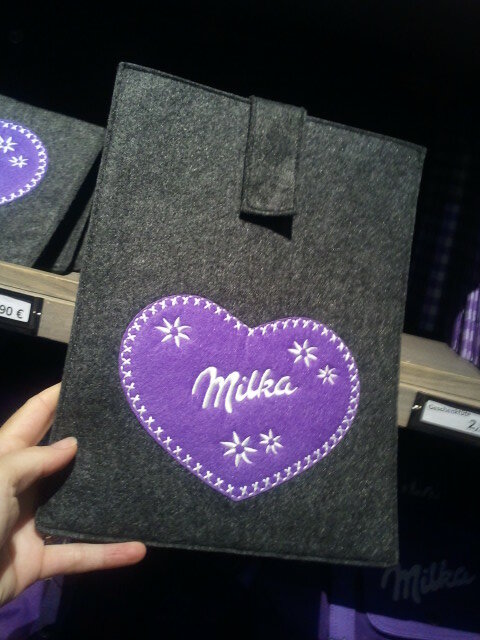 If you can answer this with a definite YES, then Milka World in Munich will be heaven on earth for you. In 2012 Milka World opened doors on an entire floor of the Schrannenhalle right behind the Viktualienmarkt, and has become a new Munich attraction. 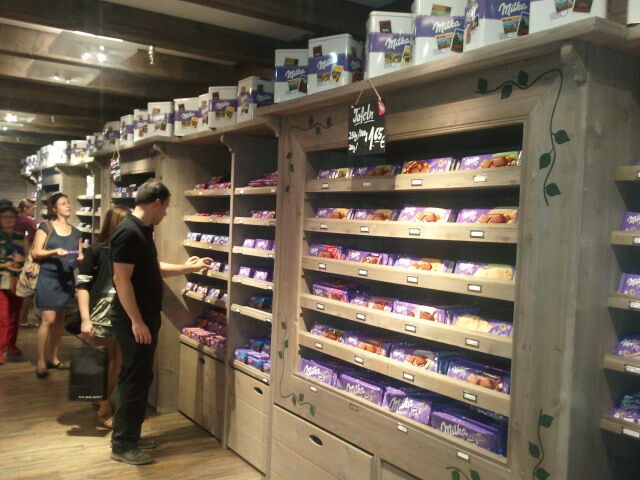 A whole store decorated in the style of an Alpine hut, with little niches and windows that seem to look out on the Alpine mountain panorama, and walls of wooden shelves just filled with the tempting chocolates of the whole Milka sortiment! But there is more. Your dog can slurp water out of a Milka bowl, while your baby is sipping on his Milka bottle, and your toddler checks out tasty Milka chocolate snacks packed away in her Milka lunchbox. And, picture this, while you start getting ready for a day at the Oktoberfest packing your Milka backpack (which is quite cute actually! ), you grab your i-pad and stash it away in the oh-so-fashionable Milka Alpine style i-pad cover that looks like a Janker (Tyrolean jacket) for this electronic device! 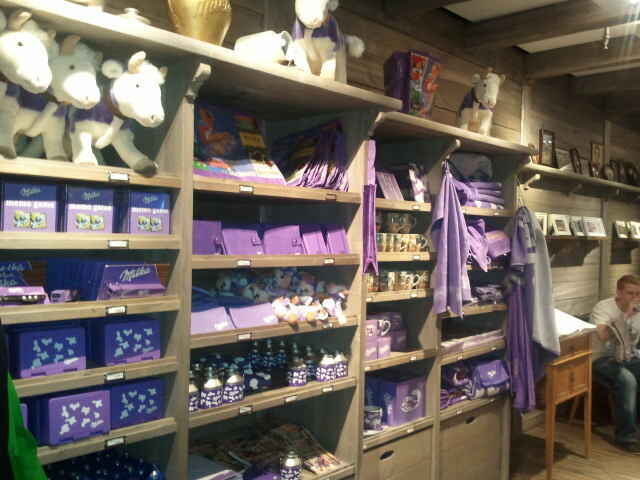 If you like, you can live ‘Milka Lifestyle‘ all the way, and organize your entire household in Milka look and feel, while you pretend inhaling fresh alpine air with every stride through your Milka home. 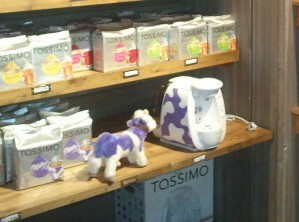 Milka cappuccino machine or toaster anyone? The merchandising kingdom has conquered Germany! Oktoberfest gets underway in less than a week, and while it is typically seen as a great season for the beer industry, one German brewer is fighting off concerns over a bacteria found in their wast water that has infected more than 165 people and killed two. Warsteiner beer is one of the top five beer brands in Germany and abides by the strict Reinheitsgebot first introduced in 1516, but their reputation is now at stake after the deadly Legionella bacteria was discovered in the waste water pumped out by the brewery. Now tourists wanting to visit the famous brewery are being told to stay away from the town in an effort to stop the disease from infecting more. Whether or not the Warsteiner brewery is found to be the breeding ground for the Legionella bacteria, officials have been making it clear that the beer is completely safe to drink. Water temperatures reach a high of 100 °C (212 °F) during the brewing process, which goes far beyond the 60 °C (140 °F) killing temperature for the bacteria. Jetzt ist’s bald so weit! Das Oktoberfest 2010 in Muenchen zaehlt die Tage bis zur Eroeffnung: 4 Tage und 0 Stunden und 59 Minuten bis das 177. Oktoberfest mit einem feierlichen Einzug die Tore oeffnen wird. Wer wissen will was da so ab geht und was es an Neuheiten gibt, kann sich auf der eignen Oktoberfest-Website aufs Genaueste informieren. Oktoberfest Souveniere gibt’s bei www.wiesn.com und wer sein Muenchnerisch/Bayerisch etwas auffrischen will, dem sei das Wiesn dictionary ans Herz gelegt! Wer’s noch schaffen will bei der Wiesn live dabei zu sein, sollte sich schicken. Die Wiesn ist nur noch bis zum 4. Oktober offen und der Eintritt ist frei! ….Unerhoert fuer uns Wahl-Kalifornier; denn hier in Kalifornien zahlt man naemlich einen Eintritt fuer die Orange County Fair oder Los Angeles County Fair, die uebrigens ebenfalls am 4. Oktober die Tore schliesst. Wer hier in Kalifornien etwas in Oktoberfest Stimmung kommen moechte, kann einmal unter dem California Oktoberfest Event Calendar nachschauen, wann und wo ein Event in naechster Naehe stattfindet. Also, noch viel Spass beim Feiern. Prost!